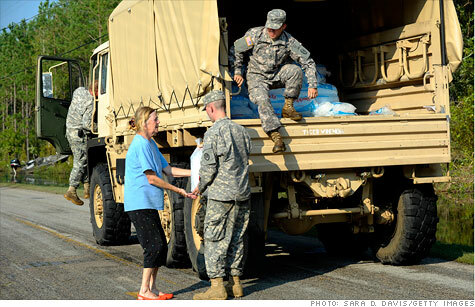 Members of the National Guard hand out bags of ice on Sunday to residents of Goose Creek Island, N.C., stranded by Hurricane Irene. NEW YORK (CNNMoney) -- The Federal Disaster Relief Fund, the pot of money used to help communities and individuals hit by disasters, is nearly depleted. That's bad news for victims of both Hurricane Irene and other disasters like the tornadoes that hit earlier this year. While individuals eligible for assistance from those earlier storms will continue to get their checks, FEMA will put other spending on hold in order to have enough cash on hand for new emergencies like Hurricane Irene. Fugate said he hopes to resume funding those long-term projects at some point, but that Congress will have to appropriate additional funds for the fiscal year ending Sept. 30 in order to do so. He added that he's not even sure that the disaster fund has enough money to cover all the costs that will be associated with Hurricane Irene, which caused flooding and other damage in a heavily-populated area stretching from North Carolina to Vermont over the weekend. "Don't know," he responded when asked if there was enough money to cover the latest storm damage. "What we've been working on will take care of quite a few folks. But as I testified back earlier this year...if we had any significant disasters between now and the end of the fiscal year, it would likely require additional funds." So far, FEMA has agreed to help state and local governments pay for preparations for Irene as well as for some immediate recovery efforts. But it has not yet authorized payments to individual victims of the storm. Fugate couldn't estimate how much FEMA has already spent on Irene, or what those costs will grow to. The House has already passed an appropriations bill for the upcoming fiscal year for the Department of Homeland Security that includes an additional $1 billion for the disaster relief fund this fiscal year. But that funding has yet to be passed by the Senate, and could end up being caught in the congressional gridlock over spending cuts and the deficit. Several House Republicans issued a statement Saturday in advance of the storm criticizing the Democratic-controlled Senate and the Obama administration for their failure to act on the additional cash for FEMA, saying they had left the agency "running on fumes." "Even though the President himself said that 'We are going to do everything we can to help these communities rebuild,' the rhetoric has not matched reality and the Disaster Relief Fund is running out of money," said Robert Aderholt, chairman of the Homeland Security Appropriations Subcommittee.